The program allows K-12 students to raise funds and help grant wishes for kids with life-threatening medical conditions. By January 1981, the Greicious Make-A-Wish Memorial was founded by Linda Pauling, Frank Shankwitz and Scott Stahl. The non-profit memorial later became the Make-A-Wish Foundation. Make-A-Wish® grants wishes to children between the ages of 2 ½ to 18 years who have life-threatening medical conditions. 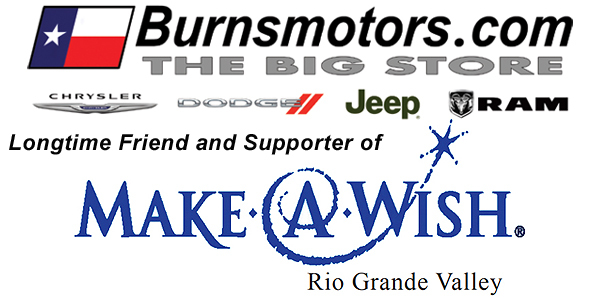 Last year, ninety-three cents out of every dollar donated to Make-A-Wish® RGV went directly to fulfilling wishes. On March 15, 2016, Oscar Galvan and his family returned from a trip to Disney World, where he enjoyed an adventure in the Magic Kingdom for his first time. Make-A-Wish® Rio Grande Valley teamed up with the South Texas Mopars Club, led by David Guzman, in a raffle to raise money to grant wishes, including that of 14-year-old, Matthew, from Alton, Texas.